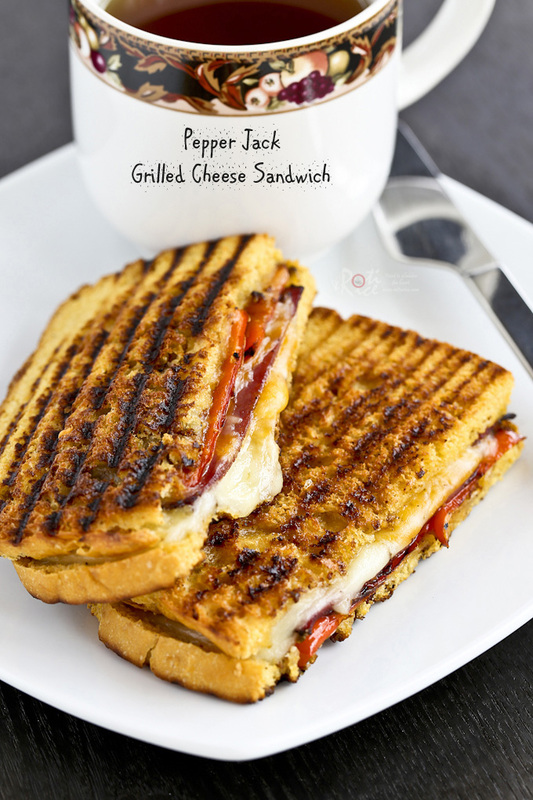 A little sweet and spicy Pepper Jack Grilled Cheese Sandwich with pastrami and roasted sweet mini peppers. So deliciously satisfying! 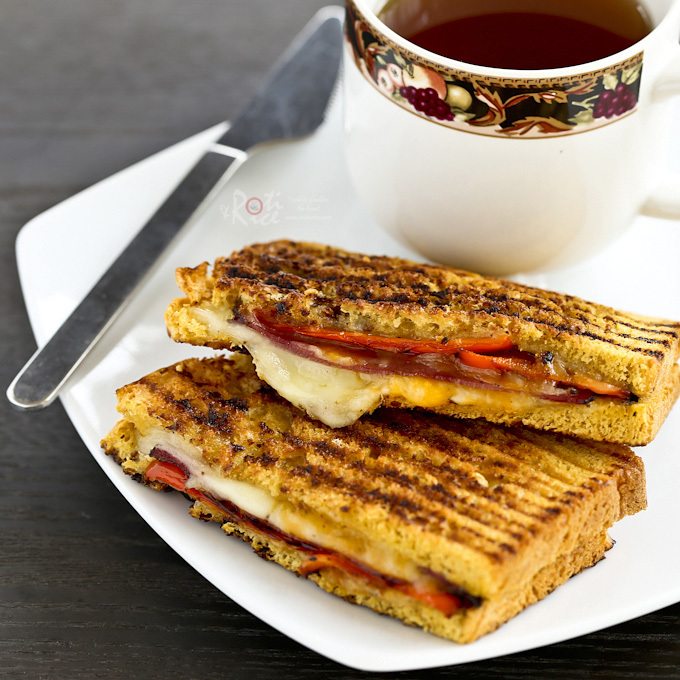 Did you know April is National Grilled Cheese Month and Sunday, April 12 is National Grilled Cheese Day? Who would have thought? The foodie world is a fun place to be in as there is always something to celebrate. 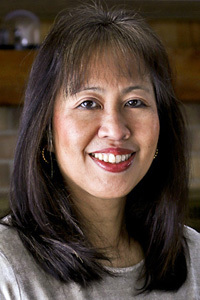 So get out your grill pan, a few slices of bread, cheese, and some butter and start grilling. You cannot go wrong with grilled cheese. They are so simple, yet so tasty. This time round, I decided on something a little sweet and just a tad spicy with these Pepper Jack Grilled Cheese Sandwich. 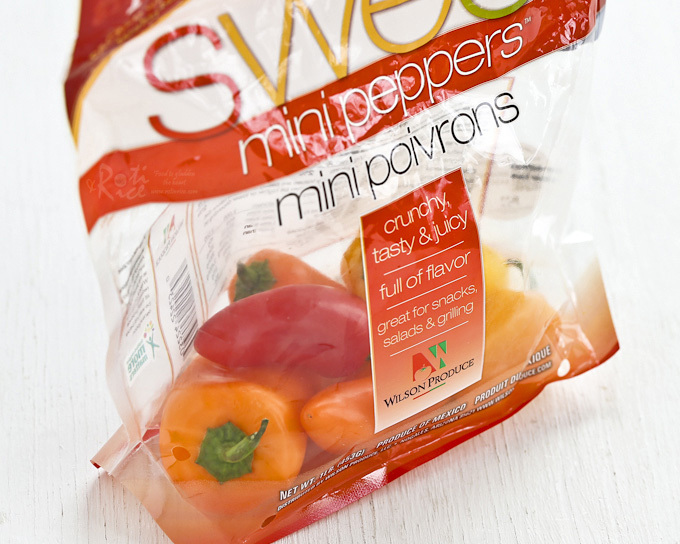 Spring is here and so are sweet mini peppers. I bought a bag earlier this week for my stir fries. Love them! They are so good when seared at high heat as they become even sweeter. I figured they would be good combined with pepper jack cheese and pastrami. I have to say they were fantastic together! Will definitely make these sandwiches again and again. In case you are wondering, I used homemade Sweet Potato Yeast Bread (minus the almond topping) for these Pepper Jack Grilled Cheese Sandwiches. That is why they have such a golden color. This bread is very easy to make using the bread machine. It is a great sandwich loaf. Do check it out. Heat a grill pan on the stove. Brush vegetable oil onto prepared sweet mini peppers and place in the grill pan. Grill peppers for about 4 minutes on each side. Remove. Place slices of bread on a clean work surface. Cover 2 slices of bread with pepper jack cheese. You may need to use more than a slice of cheese for each slice of bread. Layer roasted sweet mini peppers and pastrami on top of cheese. Top with remaining pepper jack cheese and sandwich with remaining slices of bread. Melt butter in the grill pan. Place sandwiches in the pan and allow it to cook for 2 minutes. Flip and cook for another 2 minutes. My favorite grilled cheese!!! Just make that pepper a hot one please. 🙂 Great looking sandwich!